Twitter apps are some of the most popular apps for every platform out there and webOS is no exception to the rule. 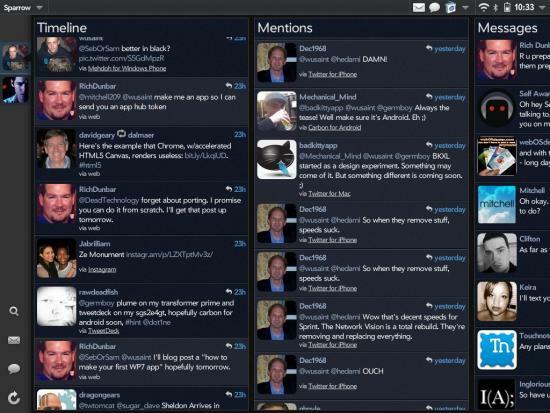 Once upon a time there were so many third party Twitter clients for webOS that it was hard to keep track of them all. However, by the time the TouchPad hit the market developer interest for webOS had already dwindled despite decent reviews of webOS 3.0. Then former HP CEO Leo Apotheker killed webOS hardware, crushing what little interest was left in developing apps for the not-even-two-months-old TouchPad. Despite the lack of interest in the platform, our diehard developers in the webOS community kept trudging away to bring us great apps (especially of the Twitter variety). A prime example of this dedication is the Twitter client Sparrow by our very own Arthur Thornton. 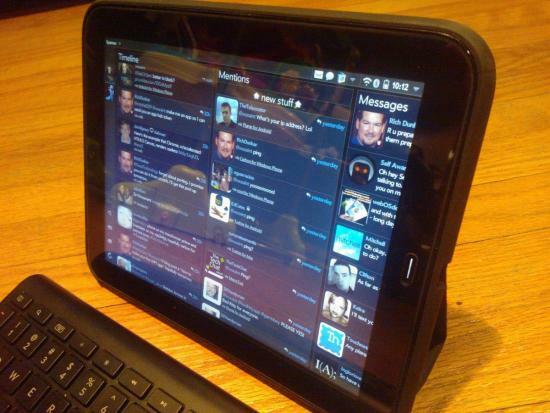 Sparrow is one of the few working and actively developed Twitter clients built for the TouchPad. Luckily for us it is attractive and well built. Much like other webOS 3.0 apps out there this app follows the tried but true three pane design that webOS fans love. It also has a very attractive dark theme that any Twitter nut can appreciate. Last but certainly not least Sparrow is straightforward and to the point. One is never confused on how to use this app. Upon initially launching the app you are greeted to a login screen to sign into one of your Twitter accounts. Signing in is as simple as inputting your account name/password and tapping "Authorize app". You literally can't get simpler than that with webOS. Once logged in you will see your account in a little panel to the far left of the screen. Tapping on the icon for that account will load the various timelines for that respective account. Adding another account is as simple as pulling down the menu, selecting "Add Account", and signing into a new account. All your accounts will appear in the panel on the far left and switching between them is accomplished by tapping on whichever account you wish to display. Once all your accounts are set up you can get down to business. As stated earlier, Sparrow uses the sliding three panel design used in most apps made for the TouchPad. The first panel is a thin little strip to the far left that contains your account, search, direct message, compose, and refresh icons. This panel can be expanded by sliding the rest of the app to the right which, giving you a better view of your accounts. The second panel is where you will spend the bulk of your time in Sparrow as it contains your Timeline, Mentions, and Messages in three vertical columns. Tapping a tweet in any one of these columns will bring in a third panel from the left for details on that tweet. Altogether this setup is quite nice and just makes sense to the user. Sparrow comes packing a couple great features from other Twitter clients and even has some nifty tricks to call its own. One feature Carbon and Graphite fans will love will be the power scroll feature: a two finder swipe on any column will take you to the top or bottom of that list. Another great feature that too many Twitter clients ignore is threaded direct messages instead of a list of received and sent messages. Threading works to group your direct messages in conversations, allowing you to focus on one exchange at a time instead of all at once - tapping on a conversation will expand it to let you see all of the messages contained within that conversation. Probably Sparrow's single biggest and best feature is push notifications. 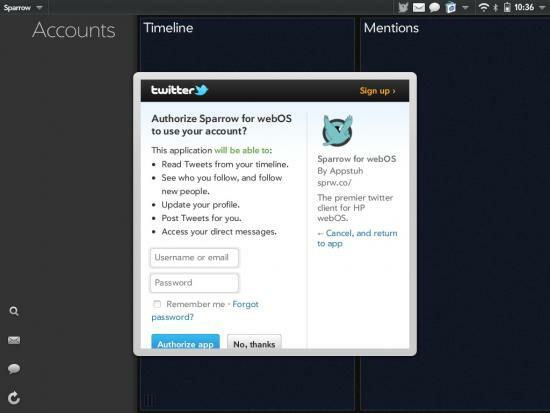 That's right, Sparrow is the only webOS Twitter app to come with push notifications. There's no more waiting to be notified of a new message or mention here! This feature alone makes it worth a purchase. Of course Sparrow also contains most basic features that any proper Twitter client should so no Twitter user will feel left in the cold with this app. In addition to the above mentioned features Sparrow has several other features planned for the future that should make us all excited. Arthur has the following features planned for the near future, including the ability to close timeline columns, username auto-completion, periodic 'polling' notifications instead of push, streaming timelines, and list support. Despite being enamored with this app it does have one or two issues which we hope are corrected in future iterations of the app but are definitely noticeable in the interim. As lovely as push notifications are, they aren't enabled in Sparrow until the app has been closed out. So basically you have to open the app and then throw the card away to get the notification system fired up. Once the card is thrown away you will have a notification pop up alerting you that "PUSH notifications are currently running. To disable them, close the dashboard.". There is also one more thing we found strange about the notifications with Sparrow in that when you get a notification tapping it does not open the app or bring the card back up. Neither of these are deal breakers by any means but they are slightly annoying. We will chalk it up as a fair trade for true Push notifications for the time being. All positives and negatives aside, keep in mind that the best part of being a Sparrow user is not being afraid of it being pulled from the App Catalog or abandoned like so many other webOS Twitter apps. Arthur is a dedicated webOS developer and despite playing around with other platforms he has not turned his back on developing for webOS nor does it look like he ever will unless webOS is truly dead. So picking up Sparrow from the App Catalog is about as future proof as one can get from a Twitter client on our platform. In the end we love this app and look forward to the awesome updates Arthur has planned. We can't think of one reason why any self respecting TouchPad user wouldn't already have this app. However if you have yet to pick it up head on over to the App Catalog and buy it today, it's $2.99 well spent.